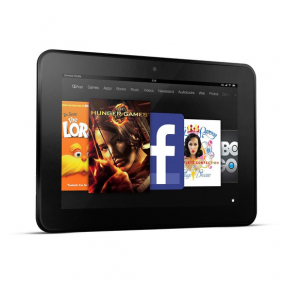 Looking to snag a Kindle Fire HD for some beach reading over the Fourth of July holiday? If you head on over to Amazon.com right now, the Kindle maker is selling the seven-inch Kindle Fire HD with 16 gigabytes of memory at its regular price of $199. But the Web is a big place. A big place with deals. And over on Groupon’s Goods section, that same Kindle Fire is on sale for $169.99, a 15 percent discount from Amazon.com. Groupon registered Groupon Goods revenue of $151.2 million in the first quarter of this year, as the daily deals company continues to try to diversify away from services. So what’s going on here? For starters, Amazon has only occasionally run sales on its new line of tablets, such as a $20-off deal for Father’s Day. And, as it turns out, Amazon didn’t itself negotiate this deal with Groupon; a third-party retailer did, an Amazon spokesperson said. This makes sense, considering that Amazon already owns its own discount online electronics seller in Woot.com. Groupon has sold at least 920 of the devices during the sale, a graphic on the sale page says. The offer is available for five more days. In the meantime, a colleague tells me that I can’t write about a “fire sale” and not treat our dear readers to this classic “Arrested Development” scene. You’re welcome.